How often do I need to get my piano tuned? We are frequently asked. “How often do I need to get my piano tuned?” Before giving an answer. I invite you to think about a couple of things. First, pianos go out of tune for a variety of reasons. You can read about that on the Piano Technician’s Guild site. Keith is a Registered Piano Technician with the Guild which means that his skills meet a certain criteria for which he has been tested. He is president of our local chapter. Secondly, all stringed instruments need tuning. Guitar’s have six or twelve strings. Violins, violas, cellos and basses have four strings. How often do they need tuning? Often, very often. In fact, they need to be tuned every time they are played or no one will be able to stand it. Not only do they need to be tuned every time but they are often adjusted between songs. I’ve even seen the musician adjusting the tuning during a song. You may know that a piano has eighty-eight keys. Did you know that the average piano has two hundred-thirty strings each one with one hundred sixty-five pounds of tension? Can you imagine having to tune your piano every single time you or your kids or your grandkids or your guests, sit down to play it? If that were necessary, it would be good to be married to a piano tuner, like I am, or learn how to do it yourself and I’m definitely not going to do that. Keith is a man of great technical patience, not me. We recommend that most clients have their pianos tuned every six months or once a year but we have many clients who enjoy having them tuned more often. They are usually artists, professionals, churches or other institutions. 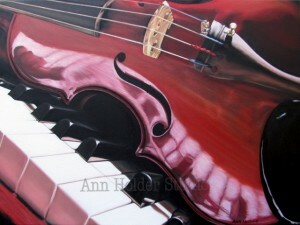 “That’s all I’m going to say about that,” but speaking of strings, I want to finish this blog by showing you a beautiful original painting, “Melodic Reflections,” that Keith’s sister, Ann, just completed. (Yes, her husband, Todd Holder, is on our Freeburg Pianos team.) As you will see below, she is an amazing artist. We are going to be displaying her artwork, and making it available for sale, in our new showroom (soon to be announced). For the time being, you can purchase prints on-line at Fine Art America.